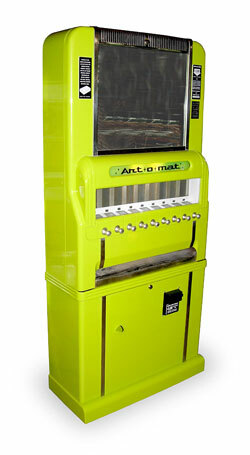 So, I went to the Art-o-mat. I’m pretty sure it is like crack cocaine in that it’s instantly addictive. It’s at my public library so I went I asked the little old lady librarian where it was. She laughed and pointed it out. I walked over to the newly decorated primitive robot. It had the word Art-o-mat scrawled across the top like a Back To The Future banner. The last time I used one of these things I’m sure I put in 35 cents and got a pack of Camel filter-less. Yes, I used to smoke. I started to scan through the offerings and I wanted one of everything. I needed tokens. I was sure they would be 20 bucks a piece. I went to the desk and asked how much the tokens were. Only 5 bucks?! I’ll take 2 please. No tax either! I’m sure they get you somehow. The ladies showed me a sample of what treasures lie in store for the clients of Art-o-mat. I couldn’t wait and swiftly returned to try and figure out which choice was best. There was some of everything. Fiber art, jewelry, poetry, books, and even a cast aluminum saltine cracker. I finally decided on a finger puppet. That should keep me busy. I dropped in the token pulled the handle and immediately recognized the sound of the inner workings. Chung-chung, and there it was in the bottom. It was in a package the same size as a cigarette pack. I picked it up but didn’t open it. I had one more choice to make. It wasn’t easy. I chose an abstract. Chung-chung. I just wanted more tokens. I took my treasures to the desk and I think the librarians were more excited than I was. The finger puppet is pretty funny. He’s got a name and apparently three more buddies. I could collect ’em all! My abstract is a cat, with glitter I might add. It’s mounted nicely on red plywood. I’ve been so excited I can’t wipe the smile off my face. The stuff is perfect for pocketbook art. Compact and unique. Therefore, I encourage you to find and Art-o-mat near you and take advantage of the array of wares offered by fellow artists for only 5, count ’em, 5 bucks a piece! It’s more fun than lottery tickets because you always get a prize! I’m gonna have to budget this in. This will turn your lights on! Sarah – I got the idea from Susan Lomuto at Polymer Clay Notes, please credit her as well.